Sotkamo’s cinema Kino Visio first opened it’s doors on 30th of March 2013. Versova Puu ry corresponds of the movie theaters operations. Kino Visio’s profits go towards youth work. 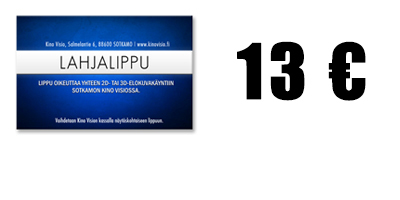 (www.versovapuu.fi). Our theater is equipped with state of the art picture and sound technology, which are suited perfectly for standard moviescreenings but also to meetings and live performance use. Digital and 3D film projectors make your moviegoing experience unforgettable. Our theater is child friendly and has wheelchair spaces. Kino Visio has 104 customer seats, two of which have reserved for the disabled. Cinema also offers popcorn, sweets, beverages and juices. Most of the films are presented in the original language with Finnish subtitles. Children’s films are mainly spoken in Finnish. Kino Visio is located in immeadiacy of Sotkamo towncenter At Salmelantie 6. When arriving from Vuokatti drive trough the city center towards the church, before which Salmelantie will be at your left hand side. After about a 1 kilometer the theater will be on the left side of the road where you can also park your car. Please use the main entrance and follow the stairs to ground floor where Kino Visio’s ticket sale and the theater hall is located. The building also has a elevator which is located at the right side of the entrance down the hallway.